The Waterloo Room hosts a wide range of activities throughout the year. Most are organised and run by the volunteers and supporters of the charity. 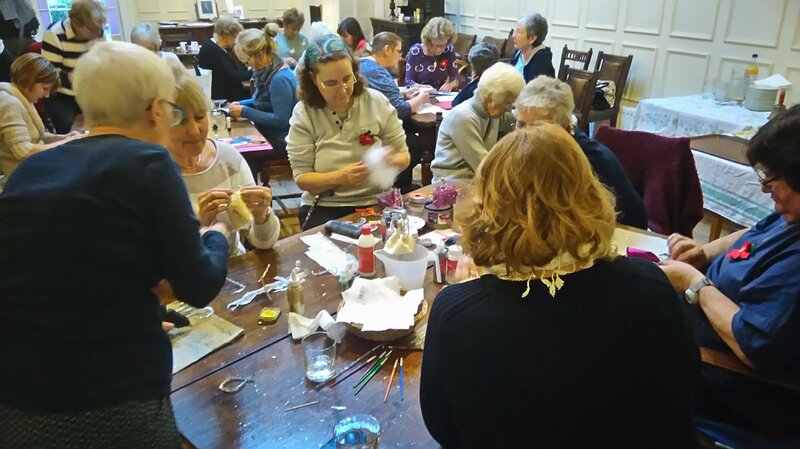 Here the Trust holds its Annual General Meeting every April, and two of its major Fundraising events of the year, namely the Annual Art Show at the end of May and the Christmas Coffee Morning on the last Wednesday morning in November. The Waterloo Room is available for hire for meetings, lectures, training sessions, and other events that the room lends itself to. Our Events Organiser Nigel Gossop will call you back. For more details on line please click here . 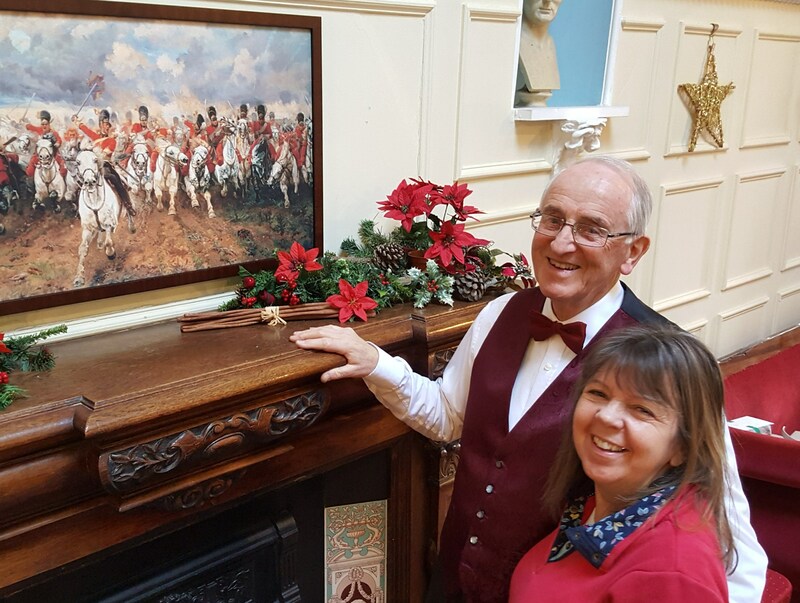 The volunteers who run the Manor Trust's small museum called the 'Bedhampton Historical Collection' have researched the history of the Waterloo Room and put together a leaflet detailing the various owners through the years and something of their history. This leaflet can be read on-line by clicking here . What are the Books and Coffee events all about? Well, firstly it’s about your enjoyment of some pleasant coffee, with perhaps a cake or biscuit in a pleasant Regency Banqueting Hall, and an opportunity to unwind for a while and meet people to chat with, or just to sit and muse on whatever is your pleasure. Along with this brief interlude in one’s life comes the opportunity to find a book to read and to enjoy, very economically, for after all, ‘reading is to the mind what exercise is to the body.’ A chance to gain one’s enjoyment and mental stimulation from elsewhere than a screen. 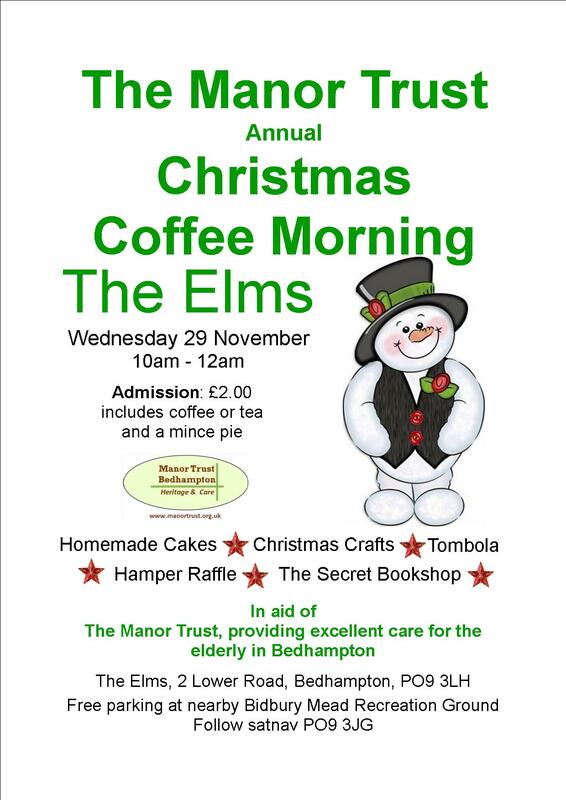 All proceeds go to the Manor Trust - this small friendly charity that is keeping The Elms and Waterloo Room, one of only four examples of the 'Strawberry Hill House' Neo-Gothic Revival architecture in the country, 'all up-together' - and that is a costly enterprise. This year of 2018, the trustees will be making major and long overdue refurbishments to The Elms, both internally and externally. If interested to know further details, please ' Contact Us ' and one of the Trust's team will get back to you. Fancy to help run a Books and Coffee morning? If you would like to volunteer to help organise and run an event like this and help this charity without digging into your pocket or purse, please let us know (see ' Contact Us ') or you can phone Nigel Gossop on 023 9237 5594. Talks are held several times a year on a wide range of topics. They are arranged on behalf of the Manor Trust by the trust's volunteer Events Organiser Nigel Gossop. 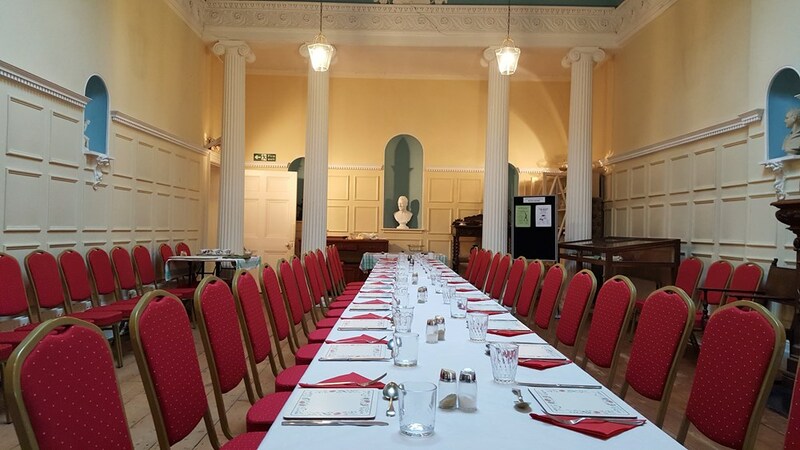 There is a small charge to attend our Waterloo Room Talks and the proceeds are all put towards the maintenance of this lovely historic Regency Banqueting Hall. The Waterloo Room is by way of being the community heart of the Conservation Village of Old Bedhampton. Your ongoing interest and support is very much appreciated by the trustees and the volunteers at The Manor Trust. For more details of how you can support the trust, please go to our ' Fundraising ' page or please go to ' Contact Us ' page on this website. If you have an interest in the local heritage of villages such as Old Bedhampton and in particular its heritage buildings, then we would like to hear from you. The Manor Trust is the charity that was set up to maintain The Elms, which is a Grade II 'Star' Listed Building with 'Strawberry Hill House Neo-Gothic' Elevations with its Waterloo Room and its Tower. Your support for this project will be much appreciated whether it be as a active volunteer helping with the building or fund-raising or just with a donation. Please click here to find how to contact us and we will look forward to meeting you. In the Waterloo Room at 2 pm a petition of 1,785 signatories was handed to the Deputy Mayor (Peter Wade, next years Mayor, as Madam Mayor was indisposed) by Bradley Barber (7yrs). This was followed by a marvellous speech by Eden Hillier-Smith (10yrs) describing growing up in the area and imploring the deputy Mayor to use the petition to get the Council to reconsider their plans and safeguard the Conservation Area for the future. The Deputy Mayor responded, visibly touched. Tea, coffee, cakes, chocolates galore and fresh pancakes were enjoyed thanks to a small army of volunteers. Richard Jones took the photos and Cllr Peter Wade and his wife walked the Conservation Area with Ron Tate before leaving after just over an hour. The petition will now be added to the submissions (H22) to the Draft Local Plan consultation. General The Lord Richards, Patron of The Manor Trust, gave his talk to a capacity audience. Using maps of various parts of the world, he described the various political situations where tensions exist and explained their countries' leaders short and long term aspirations. His views on the poor statesmanship in so many countries were refreshingly interesting and he gave his thoughts on the possible causes. His talk was concluded by answering some very apposite questions including one from his wife, Lady Richards. We hope to hear him speak again. The Christmas Coffee Morning was very successful with many visitors buying raffle tickets in the chance of winning one of the many prizes that had been donated for the occasion and also for the popular tombola. For the £2 entry fee a cup of coffee and a mince pie was served by our enthusiastic helpers - many thanks go to them. It was good to see so many friends and supporters on a freezing cold but bright morning coming for a cup of coffee and a mince pie served charmingly by our enthusiastic helpers Jill and Sam - welcome and special thanks to Sam Maclaurin and then move on to buying from the stalls. We had pleasure also in welcoming Liz Jones (in between Jill and Sam serving coffee) Liz is the local Tesco Community Champion. After a coffee and a chat, visitor enjoyed making purchases of items from the stalls, no doubt some of them made in preparation for Christmas present giving and the general festivities. The trustees are very grateful for your donations and purchases and especially grateful to all the volunteers who have worked hard for weeks planning and preparing for this important fundraising event of the trust's year. The money donated will go towards the restoration of the Elms and the Waterloo Room that is planned for next spring - watch this News page for more about that in the coming months. A joint event by the Trust's Bedhampton Historical Collection and the Secret Bookshop. 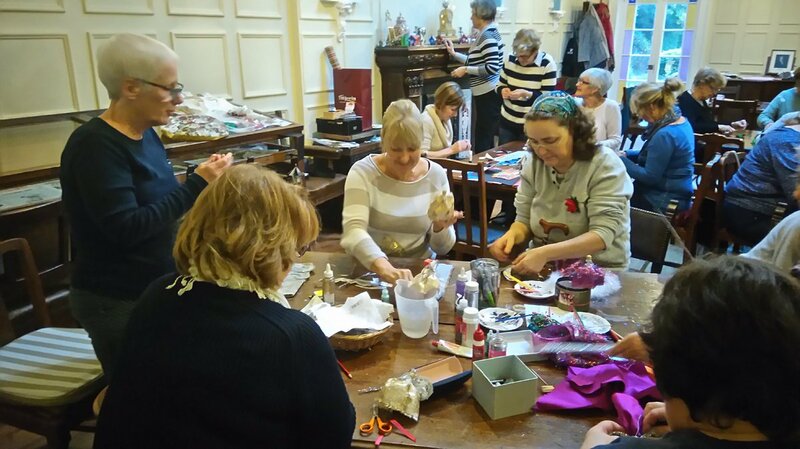 This Christmas Craft Making Day event was very well attended, and we have been told was much enjoyed and appreciated by all who took part. Our many thanks go to Jill Munden, Margaret Stanger, Nigel and Wendy Gossop for their work running this event. A very special occasion for the trust was held on this morning, the culmination of the 50th year - Golden Anniversary celebrations of The Manor Trust - at which a plaque in commemoration was unveiled by the Trust Patron General The Lord Richards of Herstmonceux in the company of the Mayor of Havant Cllr Elaine Shimbart, her Consort Cllr Gerald Shimbart, and the Member of Parliament for the Havant Constituency Alan Mak. Also present were the Trust Vice-President Richard Pratt, the trustees and previous trustees, Jenny Wride, Mike Sellis and Margaret Stanger, and trust staff. We were especially delighted to see key trust supporters of very many years Mr Rob Hoy and his wife, and Angela Maxwell and her husband, being son and daughter respectively of Cynthia Hoy, joint founding trustee with Bernard Stanley and donor of The Manor House to the trust, 50 years ago. It was with some sadness that Founding Trustee Bernard Stanley was not well enough to attend in person, but he was able to see the event as it unrolled by the use of a direct video link. The assembled party was able to give him 'three cheers' and wish him well. After the unveiling the guests all moved into the Waterloo Room for refreshments. The event Master of Ceremony was Nigel Gossop who made all the introductions and proposed a toast to 'The Manor Trust' that was roundly applauded. Many visitors came on this day, enjoyed the displays and the refreshments. A wet Garden Party was almost, but not quite, without precedent. The team were magnificent and everything was reorganised to be inside the Waterloo Room and its adjacent library. As it happens only some were put off by the weather, neither the troops of volunteers on the day bringing freshly cooked produce for sale nor the gallant supporters who came and paid their £1 entry fee at the gate, where the collector was sheltered under a gazebo from the rain. This being the year of the Golden Jubilee of the Manor Trust, it is also the 50th year as founding trustee for Bernard Stanley who came and was applauded for his brief and clear speech. A cake was made in his honour and shows a depiction of Bernard reading his morning paper and a cup of coffee. A great evening with John Clegg voicing his own performance of the story of Dickens' life holding the capacity audience enraptured. We had enjoyed a glass of wine and canapes to start with as we all assembled for this the final event in the Trust's 50th Anniversary celebration week. Sincere thanks go to Nigel and Wendy Gossop for all the planning, to Jill Munden for helping and to Wendy Harris, cook at The Lodge, for the delicious canapes. Over the weekend of 1st and 2nd of July the 50th Anniversary of the founding of The Manor Trust was celebrated. Formed in 1967 by Cynthia Hoy (Dec'd) and Bernard Stanley (Trustee) after acquiring The Manor House, which otherwise would have demolished for the building of flats. The central part of the Manor House is Elizabethan and the two wings are Victorian. Subsequently the Manor House became a Grade II Listed Building so preserving it for posterity. The trust went on to acquire The Elms in Lower Road also in the village of Old Bedhampton and also a Grade II Listed Building, and later acquired the Lodge, next door to The Elms and where the Trustees created a Registered Residential Care Home. Sadly, the Trust could no longer afford to keep the Manor House open and run as Sheltered Housing that it had done for 47 years for up to 7 residents. The building was sold on the understanding the purchasers were going to live in the Manor House as their private residence (see more about the Manor House further down the News page ). To celebrate this occasion approximately 40 Members and Friends of the Trust together with active volunteers of the charity came to a 'tea with cake party' in the Waterloo Room where the most senior in terms of age as 'Guest of Honour' was Mr Bernard Stanley, Founding Trustee, fortunately able to be present whilst convalescing from an illness. We were also very pleased to be able to welcome to the party the Patron of The Manor Trust, General The Lord Richards and his wife Lady Richards. There was a toast to 'The Manor Trust' proposed by trustee Sue Maclaurin-Pratt and the Vice-President asked Nigel Gossop to accept a gift of a bottle of his favourite tipple as his special treat after his and his wife Wendy's very many labours for and on behalf of the Manor Trust. See all about the village here . The local author Selina Stanger gave her very intersting talk to a receptive audience of just under 20. Her talk was folowed by an enthusiastic discussion of her books about the Harrison surgeons and about her experiences and some guidelines on self-publishing. Following the talk there was no rapid bolt for the door as the Secret Bookshop had laid on tea and biscuits! Thank you SBS! There was a near capacity audience to hear the life and antics of Lady Hamilton, renowned mistress of Lord Nelson. We were asked before the talk started if we thought Lady Hamilton's long affair with his lordship harmed his reputation; most thought not. We were asked the same question again at the end of the talk now knowing much more detail of her life, it's ups and downs, much more of her personality and the society of her day. The result was much the same! We are, of course, much more used to scandal in high places these days. This year's Art Show was a great success with many visitors over the three days and who came and viewed and purchased pictures and various objects d'art, as well as enjoying tea and coffee with a slice of good home made cake or a scone, cream and jam. Just over £1,000 was raised for The Manor Trust which will go towards the heavy up keep costs of the Waterloo Room. For example the trustees are planning internal redecoration (the need is obvious to those who spot these things! ), and that doesn't come cheap. For example, many of our supporters are surprised to find we cannot reclaim VAT on the bills for redecoration work. The 50th AGM was held on Saturday 6th May 2017 in The Waterloo Room of The Elms. At the Meeting the Chairman, Vice-President Richard Pratt gave the announcement that the Trustees are pleased and honoured that General The Lord Richards of Herstmonceux GCB CBE DSO DL has kindly agreed to become the Patron of Manor Trust. Lord Richards resides locally and although he leads an extremely busy life his aim is to support the Trust whenever possible. Lord and Lady Richards came in April to meet the trustees, staff and several key volunteers. Both were fascinated by The Elms and Waterloo Room as well as being very interested in the work of the Lodge where they spent some time talking to staff and some residents. The announcement was very much appreciated as welcome news and we hope that Lord Richards will have a long and happy relationship with the charity, its trustees, staff and volunteers. At the AGM there was a good turnout of Members, Friends and Life Friends of the Trust as well as supporters and guests. We thank you all for coming and partaking of this important annual event in the business side of life in the Manor Trust. The light refreshments and a glass of wine or juice were much appreciated after the AGM. Our first Coffee Morning with Books held in the Waterloo Room was very well attended and friends and supporters came from far and near to enjoy the coffee, the cakes and biscuits, the conversations and browsing and purchasing a good read to take home from the Secret Bookshop. The funds raised all go to help with the running of the Manor Trust which in 2017 means very largely going towards the upkeep and some structural work on the Waterloo Room itself and the Grade II 'Star' Listed main building 'The Elms.' Our hearty thanks go to Nigel and Wendy Gossop, Margaret Stanger and Jill Munden for putting on this first event. Michelle Magorian's talk proved very popular and the event was a great success. The Waterloo Room was filled and the afternoon went so very well people stayed and chatted which was pleasing from the trust's aims to increase the community's awareness of itself. There were a lot of new local people, some of who had lived in Bedhampton for a long time but had never been to vist our talks before, so that was good. With very many grateful thanks to our very active supporting organisation, The Secret Bookshop, its proprietors Nigel and Wendy Gossop were able to gift to the trust a complete set of new folding tables with fine light oak wooden tops and sturdy folding legs. Here we see the presentational view with the damask table covers kindly donated by a supporter, who wishes to remain anonymous, and the tables laid ready for the Thursday Luncheon Club, which is enjoyed by up to 25 elderly locals every week; a two course freshly cooked luncheon for a very modest contribution followed by a cup of tea! Mark Wingham's talk at The Elms on Tuesday 1 November gave an entertaining and funny insight into a long forgotten Portsmouth and Southsea that is hard to recognise as the city we know today. The image is reproduced with the kind permission of Mark Wingham. On the fine summer evening of Tuesday 7th June, at the invitation of Nigel Gossop of the Bedhampton Historical Collection, Dr Philip MacDougall gave his presentation 'If war should come' (see the poster) to a very interested audience. We were reminded that in the two and three years immediately before war was declared the country was mostly quite ill-prepared for what was to come, but the public, somehow always more perceptive than it's Government, had a fear of bombing, having seen pictures of what was happening in Spain at that time. In all this was a very interesting talk as Dr MacDougall was able to show local scenes of happenings and activities in very local places such as Chichester and Southampton etc. The restoration of the tower was finally completed on Saturday 10th October by putting the finishing touches to the painting of the moulds and features in white. On Friday 23rd October a small celebration of the safe and satisfactory completion of the works was held in the Waterloo Room. An account of the whole project is available on this website's Fundraising page .